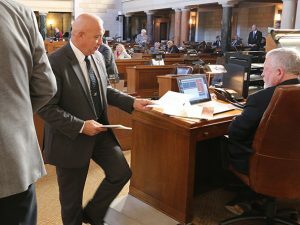 Senators reconvened Jan. 5 to begin introducing bills. Sen. Tom Brewer delivers a bill to the Clerk. LB75, sponsored by Omaha Sen. Justin Wayne, which would provide for restoration of voting rights upon completion of a felony sentence or probation of a felony. A complete list of bills introduced thus far is available at NebraskaLegislature.gov. New bills may be introduced for the first 10 legislative days, or until Jan. 18.